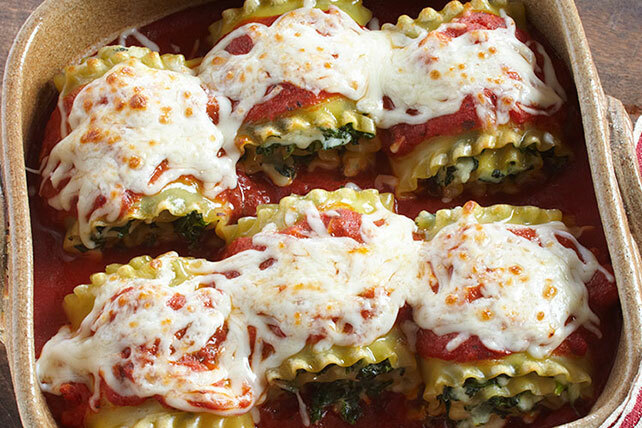 Everything you love about lasagna: pasta, spinach and sauce, plus three kinds of cheesiness, all rolled up into one perfect bundle of gooey goodness. Mix cream cheese, spinach, 1 cup mozzarella and Parmesan until blended; spread onto noodles. Roll up tightly. Place, seam sides down, in 9-inch square baking dish; top with sauce and remaining mozzarella. Assemble as directed and cover with foil. Refrigerate up to 24 hours. When ready to serve, bake in 375ºF-oven 40 min. or until heated through. Prepare using PHILADELPHIA Neufchatel Cheese and KRAFT 2% Milk Shredded Mozzarella Cheese. Stir chopped fresh basil and/or sliced mushrooms into sauce before using as directed. Assemble as directed and cover tightly with foil. Freeze up to one month. Thaw completely in refrigerator overnight. Uncover and bake in 375ºF-oven 40 min. or until heated through.